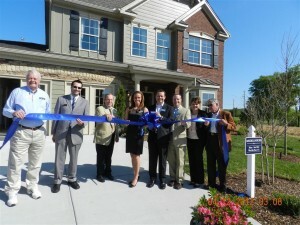 Canterbury Model Ribbon CuttingThursday, April 12, 2012 was a very exciting day for Goodall Homes, as we celebrated the Grand Opening of a Brand New Model Home at our Canterbury neighborhood in Thompson's Station. Canterbury is a beautiful community off of Critz Lane, and has very convenient access to 840 and I-65. Our homes in this community start at $209,990, and we have both one and two-level homes available. The model home features our Richmond II floorplan, which includes 5 bedrooms and 3.5 baths! We would love to allow you the opportunity to take a walk through this beautiful home. Please call Amber at (615) 448-8929 to schedule a time to learn more about all we have to offer at Goodall Homes at Canterbury.